The cow is the sacred animal and worshipped as a god. It is interesting, to see the milking of cows by hands during the time of sunrise. Nobody hates shopping. 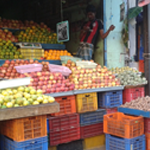 Finding your needs in the market full of small shops.It is fun to buy things,at affordable prices in the road shops. You might have heard about home-based business.Ladies sell rice batter prepared by themselves. 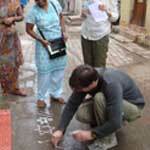 It is a kind of self-employment for their livelihood. Take a sip, along with local people leisurely talking and reading newspapers.It is the best place for interacting to know them better.A small petty tea shop proves Madurai as a sleepless city. 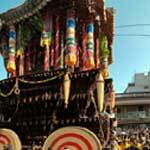 The lofty chariot will be vibrantly decorated with colorful flowers which makes this festival more interesting to watch. Enjoy the festival by walking through the road along with the chariot. Be amused to see small shops with plenty of books. It serves as the small library for the people for both reference and purchases purpose. It shows the impact of their civilized culture. You will be stunned to watch the gigantic pillar rich in architecture and for its timeless beauty. It was constructed for elephants which is a part of Thirumalai Nayak Mahal palace. Kolam is a form of painting that is drawn by using rice powder or chalk powder or white rock powder often with naturally or synthetically colored powders during festival occasions. Every morning particularly in Tamil Nadu, millions of women wake up before sunrise. Sandalwood paste is integral to rituals and ceremonies, to mark religious utensils, and to decorate the icons of the deities. It is also distributed to devotees, who apply it to their foreheads or the necks and chests. Preparation of the paste is a duty fit only for the pure, and is therefore entrusted in temples and during ceremonies only to priests. Please use contact form below to get in touch with us. We we'll respond as soon as we can.